=►Boil three eggs with enough water and cut into pieces (lengthwise). =►Heat 3tsp of oil in a pan, add sliced onion and salt into it. =►Fry it well till the onion becomes golden brown. 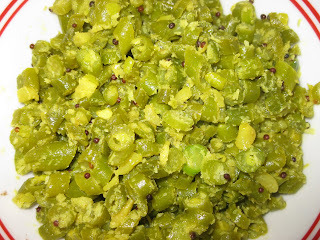 =►Add sliced ginger, garlic, curry leaves and green chilies into it. 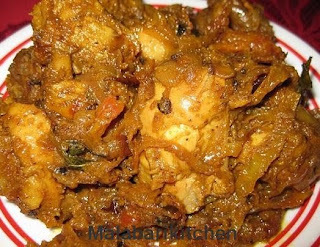 =►Add sliced coconut, turmeric, chilly powder and garam masala into it. =►Saute it well ( 2-3min) and add 3 tsp of water into it. 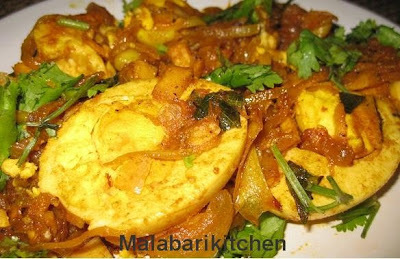 =►Put egg pieces into above mixture and mix it (make sure that egg do not break) . =►Switch off the flame and garnish with chopped cilantro.